IV Pole - Telescoping: IVP | Altus, Inc. Adjust the height from 22" to 40"
Weight Limit Not to Exceed 8 lbs. Build up your workstation on wheels. Strengthen your clinician mobile IT cart. Constructed of durable, anodized aluminum tubing, this equipment pole is a robust add on you can be confident in. Ideal for the fast-paced and demanding hospital environment your clinicians face on a daily. Painless setup. Assembles quickly onto the cart with a locking collar. 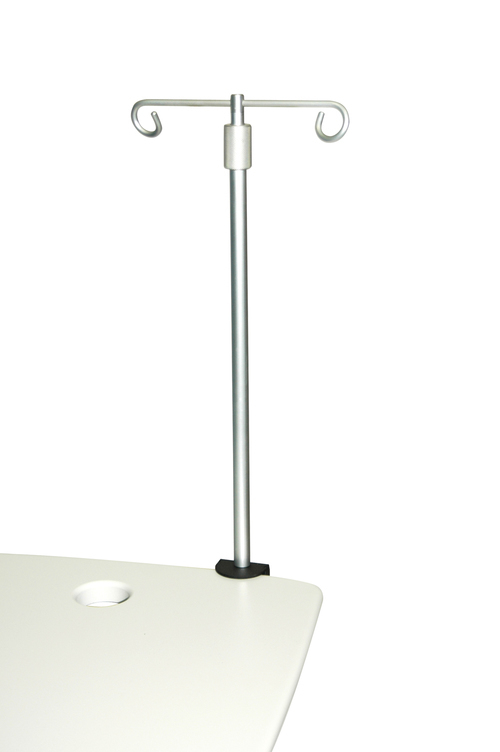 Equipment pole telescopes can be easily adjusted to the desired height ranging from 22” to 40”. Accommodate different ergonomic, safe and secure height requirements with ease! Advantageous placement. Keeping critical IV fluids with the clinician on the go, anywhere they go in the hospital is a benefit of the equipment pole from Altus. Featuring two dual hooks, you can accommodate two IV bags.